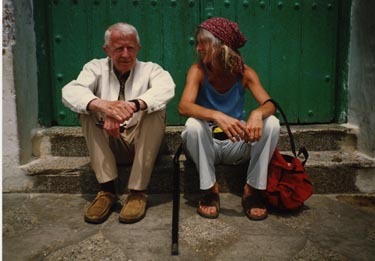 UC Santa Cruz music lecturer Irene Herrmann and Paul Bowles (pictured below) in Asilah, Morrocco, 1993. (Photo courtesy of Irene Herrmann). 2010 marked the centennial of the birth of renowned American writer and composer Paul Bowles, who was born 100 years ago on December 30, 1910. In honor of the occasion, six major Paul Bowles Centennial events took place last year, five overseas--in Seville, Spain; Cologne, Germany; Málaga, Spain; Lisbon, Portugal; Tangier, Morocco--and one in the United States at Boston University. 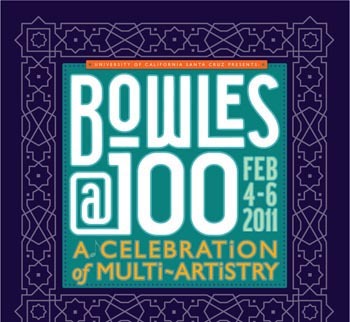 The seventh and last major centennial event, "Bowles at 100: A Celebration of Multi-Artistry," will be held at the University of California at Santa Cruz on February 4–6, 2011. Bowles is perhaps best known as the author of The Sheltering Sky, the popular novel that was later turned into a feature film in 1990 starring John Malkovich and Debra Winger. But few people realize that the prolific writer thought of himself primarily as a composer of music. On that note, the UC Santa Cruz centennial celebration was initiated by music lecturer Irene Herrmann--who also happens to be the inheritor of Bowles’ musical estate. Herrmann visited Bowles in Morocco every summer from 1993 until his death in 1999. She is co-editor of Paul Bowles on Music, a book that spotlights the intersection of his two great passions—writing and music. “I can’t think of any other person in the 20th century who contributed to so many aspects of American culture,” Herrmann noted. “Because his music is mostly out of print, or never been published, I have access to all of it. I’ve been able to put together programs of music that would not ordinarily find its way to the concert stage,” she added. As a result, there will be several world premieres of Paul Bowles' compositions featured during the UC Santa Cruz Centennial event. There will also be an appearance by filmmaker Sara Driver (longtime partner of film director Jim Jarmusch), who will present her long-lost 1980s film of the Bowles short story You Are Not I.
Driver’s recently discovered and restored film was just screened for the first time in two decades late last year at the Reykjavik International Film Festival in Iceland and also at the Portuguese Cinémathèque in Lisbon. (http://www.nytimes.com/2010/11/13/movies/13driver.html). Other highlights of the centennial celebration include a keynote lecture/reading by celebrated novelist Edmund White; an art exhibition of photographs and artifacts from Bowles’ six-decade career; screenings by Moroccan filmmakers; plus a two-day scholarly conference with presentations on Bowles work as a writer, composer, translator, and ethnographer. The executor/inheritor of Bowles’ literary estate, Guatemalan writer and translator Rodrigo Rey Rosa, will also be attending the conference. “We are highlighting Bowles as a multi-artist…as a fiction writer, master short story writer, poet, transcriber, songwriter, ethnomusicologist, and world traveler,” noted Tyrus Miller, UCSC literature professor and Vice Provost and Dean of Graduate Studies, who is co-presenting the festival with Herrmann. “I believe the UC Santa Cruz centennial is the only conference where both the musical and literary executors of Bowles estate will be participating,” he added. For more information and a complete schedule of events, go to http://bowles.ihr.ucsc.edu or contact the Institute for Humanities Research at (831) 459-3527. This UC Santa Cruz Paul Bowles Centennial is presented through a grant from the National Endowment for the Arts, with support from UCSC’s Institute for Humanities Research, Porter College, Cowell College, Music Department, Office of Research, Division of the Arts, and Division of Graduate Studies.